Like his twin brother Greg, David (Lawrence) is gifted in both art and writing poetry. One of David's favorite artistic pastimes is painting Simpsons characters on denim jackets, such as the one he created for a woman who so admired the one he made for himself that she stopped him on the street and offered to pay him $100 if he would make one for her grandson. His past acting credits include the TV movie Victory at Entebbe (in which he appeared with his brother), and several commercials for Listerine, Southwestern Bell, and Pillsbury (in all of which he appeared with his brother). "Who knows," he says. "One of these days I may even return to acting, but for now I prefer to kick back and experiment with Today one of those careers includes being the head chef and kitchen manager for Italy's Little Kitchen in Manhattan Beach, California. Besides painting, David enjoys other hobbies, such as riding motorcycles, winter skiing, and skateboarding. What are his favorite contemporary TV shows? M*A*S*H, Absolutely Fabulous, COPS, and All My Children. Of the latter, he says, "It's the only soap I can stand. David is engaged to Paula Matveld. One of the careers with which Greg Mandel (A.K.A. 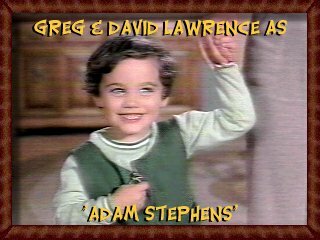 Greg Lawrence) once experimented was operating a small pizza and pasta restaurant in Simi Valley, California, with his brother David. Though they developed a happy and faithful clientele, they found themselves bored with the restaurant business after two years and decided to sell. Greg, an avid water and snow skier, currently works as a production assistant for New Wave Entertainment (in Burbank, California), which produces trailers for new, upcoming films and radio and TV spots. Greg was recently married (his wife's name is Teri). They have no children, but dote on five cats. Greg and David's mother admits that her sons are typical products of the 1970s and 1980s, and says she's a parent from the fifties who prefers to see them well-educated, with their feet firmly planted on a path toward responsible and lucrative futures. "Not only are they gorgeous, bright, and extremely creative young men," she says, "but they are warm, generous, caring, and beloved by friends and family alike."